We've experimented with all kinds of paints and fabrics, and nothing gives you the light absorptive power of black velvet fabric. 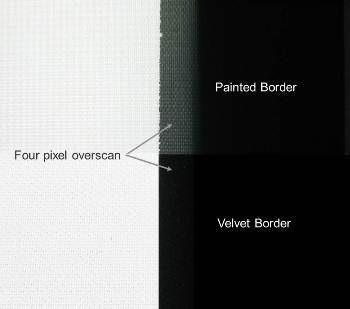 While painted trims are the common solution, our black velvet fabric borders are so dark that you may need to put a piece of masking tape on the screen to see where the overscan pixels are. 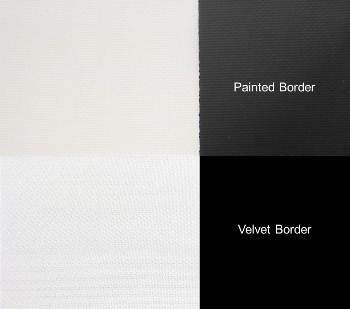 Even ultra-flat black paints look grey in comparison to our black velvet fabric. We have new techniques and patented tension features that allow the velvet borders to roll up flat with the screen material, giving you a very flat image surface and the sharp-edged, high- contrast image "pop" that only the best fixed frame screens can offer. No other retractable projection screen in the world uses fabric velvet borders or comes even close to the image edge and contrast that our new design offers. The upper right photo shows with ambient light the difference in color between a painted border from a major screen company and the Center Stage velvet trim. What does this do to your image when the lights are turned out? The lower right photo shows the results in a darkened room with a projected white image and four pixels of overscan. Note how the velvet soaks up the overscan, which gives your image a sharper, better defined border with improved dynamics. 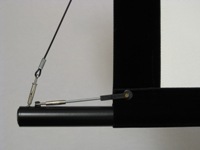 Our patented stealth tab tensioning is a standard feature. We stitch on a fabric velvet border which allows us to conceal the tension tab and tension cables behind the borders. While the bottom corners at the weight bar and top near the case are visible, we've eliminated the ugly hourglass shape and huge width penalty of common tensioned designs. Most importantly, we've eliminated the price penalties that other companies charge for their tension designs. How light reflective are the surfaces behind your screen? With the Center Stage retractable screen, it doesn't matter. When you're done watching Dr. Phil on your TV and are ready for a real movie experience, drop the Center Stage screen in front and don't worry about reflections from behind. The black backing layer is a standard feature. You won't want to have light sources behind the screen, however. Window shades pay for themselves and keep your neighbors from seeing your Netflix habits. Gen5™ motors Our new Gen5 motors are faster, quieter, and have many more control options. If you only want the simplest, least expensive method of retracting the screen, opt for our RF-only motor. If you want to tie a Gen5 motor into a wall switch, IR control, or universal remote, then opt for the 4-wire version and add the extra components you need. Either motor is included in the base electric screen prices. 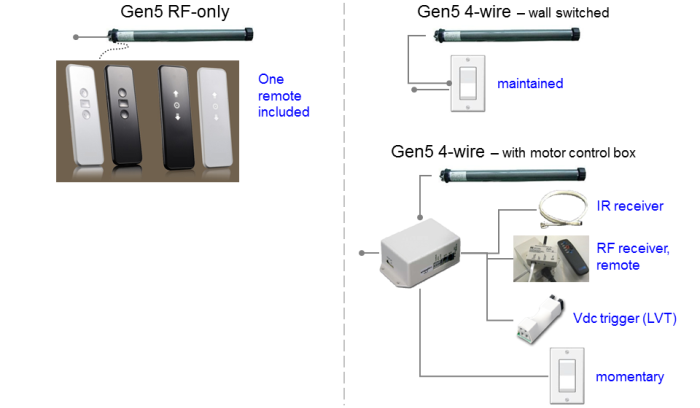 Gen5 RF-only The RF-only Gen5 motors come with one wall-mountable RF control, in your choice of white or black, with buttons or smooth capacitive touch screen. You don't have to aim the remote at the screen, and the motors are quiet and reliable. The limitation is that you cannot tie these motors into your universal remote or automation system. Even universal remotes that have RF capability only use RF to transmit their codes. We're not aware of any remotes that can learn RF signals. Gen5 4-wire The 4-wire Gen5 motors come with separate power wires for the up or down positions. You can directly wire these into our maintained paddle switch if you only want wall switch control. If you want wall switch, IR, trigger and universal control, then get our Gen5 motor control box and any other necessary peripherals. Maintained wall switch Use this maintained-contact paddle switch if you are just wiring the switch directly to the motor and don't need any other control options. They stay in the up or down position, routing power constantly to the 4-wire motor's up or down power wire. The motor has built in mechanical limits, or the switch also has a center stop position. These are 115Vac only and are available in ivory or white. 4-wire control box If you want to control your Gen4 motor with a flexible combination of a wall switch, IR, Vdc or universal remote, then you'll need this motor control box. They are available for 115Vac or 230Vac and are white only. They come with a 6' white IEC detachable power cord. Momentary wall switch Momentary-contact paddle switches are available in ivory or white to connect to the control box. They spring back to center position, only providing a closed "dry" contact for the up or down terminals. The motor control box only needs a 0.5 second or less closing of the dry contacts to function. You can alternatively use external relays to perform the same function. Power connector wall plate If you want to run the screen's 4-pin power cable through a wall or ceiling, this wall plate kit comes with: single gang white cover plate, mounting screws, one 4-conductor plug and male mate for motor connector, assembly tool and strain relief. Mini receiver IR These mini IR receivers are available in 5" or 24" white or 72" in white or black. They connect directly into the control box via a 6P4C line connector into the "eye" port. While we have a generic IR remote if you need it, chances are it would be better to just download our IR files below. IR wall mount receiver Looking somewhat like a golfball, this is wall-mountable with screws. IR J-box receiver If you want to hide the IR receiver in an electrical box with switches, this Decora-style IR receiver hides behind a violet lens cover. IR remote You should be able to download the IR codes directly into your universal remote by searching their library for an appliance control called "Seymour AV" or directly download the codes below. But if you can't, we do have an IR remote available. Vdc trigger The LVT Bus takes a low-voltage DC trigger input and translates it into a bus command that the motor control box will understand. You get the LVT Bus module and a 6" white phone cable that plugs into the "eye" port. As a side note, when you order this, we reverse the up and down power wires in the control box connector to operate as expected (voltage present, screen comes down). RF receiver, RF 5-channel remote If you want to add RF control to your 4-wire motor with control box package, you can simply plug this RF receiver into the "eye" port using a line cable, and use the 5-channel RF remote. 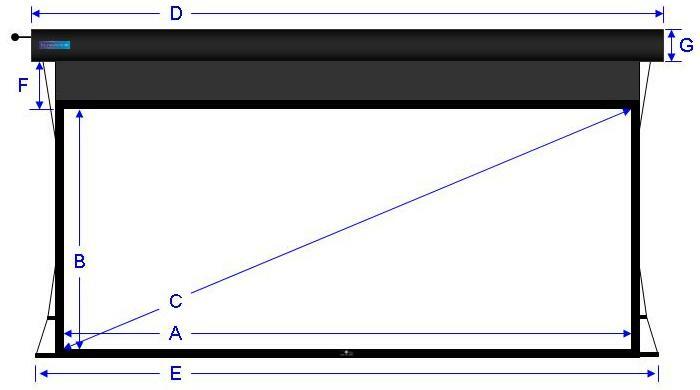 The remote will broadcast in channel 1 for the screen, channels 2, 3, or 4 if you need to control other product, or all five channels at the same time. This is a great solution for those who like RF, but want more control options for their screens. Special order We have several lengths or can make custom white or black phone line data cables. If you need to plug two things into the "eye" port, such as a Vdc trigger and RF receiver, we have a phone line splitter / adapter with 6P6C male and two females. Less common modules we can special order include Z-wave, RS-232, USB to DE9 serial, and serial to Ethernet adapters. Just in case you NEED to drop the screen using your iPhone from work. 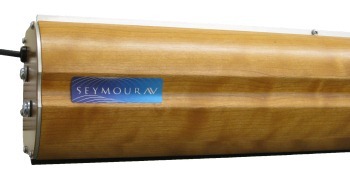 Natural aluminum (left), and custom ivory (right) case finish options. Satin black is of course the most common choice. Premium natural cherry (left), and Fidelio velvet in a dark room (right) case finish options.